Prior to joining the University of Exeter Business School in 2015 as a Lecturer in Economics, Sebastian Kripfganz completed his doctoral studies at Goethe University Frankfurt where he also held a position as a research and teaching assistant. His international experience includes a research visit at Michigan State University on invitation by Professor Jeffrey Wooldridge and a short-term consultancy in the Poverty Reduction and Economic Management Network of The World Bank in Washington, DC. He can also look back to a 19-months professional experience in the Economics Department of Bayerische Landesbank after he received his Economics diploma from the University of Mannheim. His research interests centre on dynamic panel data and spatial econometrics. Dr Kripfganz’ research topics are primarily in the area of panel data econometrics with a special focus on estimation and specification of dynamic panel models when the time horizon is short. His work includes the development and improvement of generalized method of moments (GMM) and maximum likelihood (ML) estimation procedures in models with incidental parameters and cross-sectional dependence. He also places special emphasis on the robustness of estimation and inference methods to model misspecification. Besides his methodological work, Dr Kripfganz is interested in the application of these methods to the analysis of human well-being, both at an aggregate and disaggregate level. This includes the determinants of economic growth and regional convergence, the dynamics of individual and family income, as well as the analysis of social interactions and network effects. The current research of Dr Kripfganz is concerned with the likelihood-based estimation of dynamic panel data models with cross-sectional spillover effects, the identification of peer effects in social networks, and the treatment of time-invariant variables in panel data models. 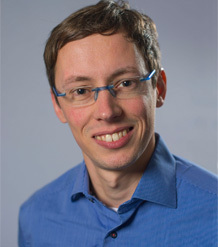 Parallel to his research, Dr Kripfganz is also developing a set of comprehensive Stata commands that he is making available to the research community. We present a sequential approach to estimating a dynamic Hausman‐Taylor model. We first estimate the coefficients of the time‐varying regressors and subsequently regress the first‐stage residuals on the time‐invariant regressors. In comparison to estimating all coefficients simultaneously, this two‐stage procedure is more robust against model misspecification, allows for a flexible choice of the first‐stage estimator, and enables simple testing of the overidentifying restrictions. For correct inference, we derive analytical standard error adjustments. We evaluate the finite‐sample properties with Monte Carlo simulations and apply the approach to a dynamic gravity equation for U.S. outward foreign direct investment. Kripfganz S (2016). Quasi–maximum likelihood estimation of linear dynamic short-T panel-data models. Stata Journal, 16(4), 1013-1038.
bias. Both random-effects and fixed-effects versions are available. Copyright 2016 by StataCorp LP. Kripfganz S, Schneider DC (In Press). ARDL: Stata module to perform autoregressive distributed lag model estimation. ardl fits a linear regression model with lags of the dependent variable and the independent variables as additional regressors. Information criteria are used to find the optimal lag lengths if those are not pre-specified as an option. The estimation output is delivered either in levels form or in equilibrium correction form. The Pesaran, Shin, and Smith (2001) bounds testing procedure for the existence of a levels relationship is implemented as a postestimation command. Corresponding critical values as well as approximate p-values are available for any sample size, number of regressors, and lag combination. Kripfganz S (In Press). XTDPDGMM: Stata module to perform generalized method of moments estimation of linear dynamic panel data models. xtdpdgmm implements generalized method of moments estimators for linear dynamic panel data models. Linear moment conditions can be combined with the nonlinear moment conditions suggested by Ahn and Schmidt (1995). The Windmeijer (2005) finite-sample standard error correction is implemented for estimators with and without nonlinear moment conditions. Available postestimation statistics include the Arellano-Bond test for autocorrelation of the residuals and Hansen's J-test for the validity of the overidentifying restrictions. Kripfganz S (In Press). XTDPDQML: Stata module to perform quasi-maximum likelihood linear dynamic panel data estimation. xtdpdqml implements the unconditional quasi-maximum likelihood estimators of Bhargava and Sargan (1983) for linear dynamic panel models with random effects and Hsiao, Pesaran, and Tahmiscioglu (2002) for linear dynamic panel models with fixed effects when the number of cross sections is large and the time dimension is fixed. In the fixed-effects case, the estimator of Hsiao, Pesaran, and Tahmiscioglu (2002) maximizes the transformed likelihood function after a first-difference transformation of the model. Robust standard errors are available and unbalanced panel data sets are supported. Kripfganz S (In Press). XTSEQREG: Stata module to perform sequential estimation of linear panel data models. xtseqreg implements sequential estimators for linear panel data models with the analytical second-stage standard error correction of Kripfganz and Schwarz (2015, ECB Working Paper 1838). The command can be used to fit both stages of a sequential regression or either stage separately. One-step and two-step GMM estimation is possible at both stages including system-GMM estimation based on linear moment functions for the first-differenced and the levels model. Available postestimation statistics include the Arellano-Bond test for autocorrelation of the residuals and Hansen's J-test for the validity of the overidentifying restrictions. Kripfganz S, Schwarz C (2015). Estimation of Linear Dynamic Panel Data Models with Time-Invariant Regressors. ECB Working Paper(1838). Full text. The teaching interests of Dr Kripfganz are closely related to his research area. He enjoys teaching fundamental and state-of-the-art econometric methods, particularly concerning the analysis of panel data sets. In his courses, he aims to provide the students with a requisite know-how that will be of practical use for them irrespective of whether they want to follow the path of an academic or a professional career.